This coming Halloween Sentosa will be teaming up with renowned Thai movie production studios, GMM Tai Hub Co. Ltd. (GTH), for its annual signature Halloween event – Sentosa Spooktacular 2013. You have survived the Thai horror movies. Will you survive the LIVE Thai horror this October ? Only on 18 Oct 2013. Only 666 limited tickets. It is already SOLD OUT. Priority access. Not inclusive of admission ticket. Admission to Fort Siloso only. Excludes haunted trails. 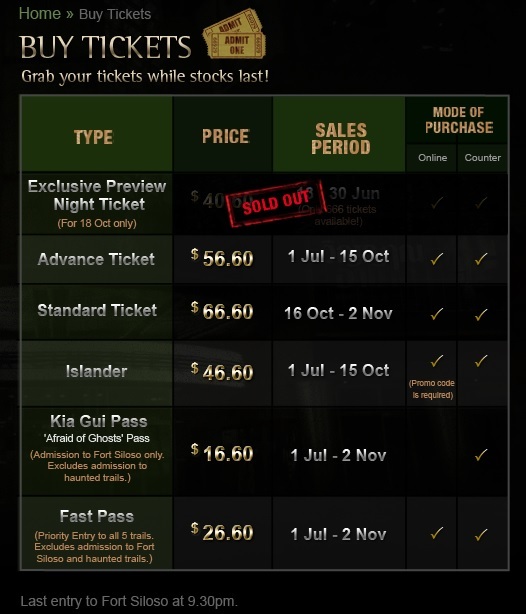 Tickets can be purchase at the Sentosa ticketing counters and online. For further information and to buy event tickets, visit the Spooktacular website.